Well, hello there color lovers and Happy Monday to you! I'm just popping in to give you your daily dose of color. And today I'm especially excited because I have a very fun wedding trend that is super hot right now in the world of weddings. Looking for a unique way to incorporate color into your upcoming wedding or party? Well, have you ever considered going for an ombré theme? Here lately I've really been loving this look. And I'm hoping you can see why? There's just so many beautiful ways you can incorporate this style. From invitations to favor tags, I think it's plain to see that there's no shortage of ways to incorporate this beautiful trend into your wedding day. It's all about showing a progression of color. Whether it's a look that incorporates a monochromatic look with various shades of one color. Or maybe you want to show cool colors or warm colors in this ombré style? Whichever you choose, it's a look that will surely stand out! 22 Comments " Color Trend: Ombré Wedding Ideas "
I don't think I'll ever get tired of ombre - it's so pretty! These are such fun - and chic! - ways to bring in ombre! I love the tri-colored napkins in that modern place setting! I just love a good bit of ombré–gradient cakes especially make me smile! 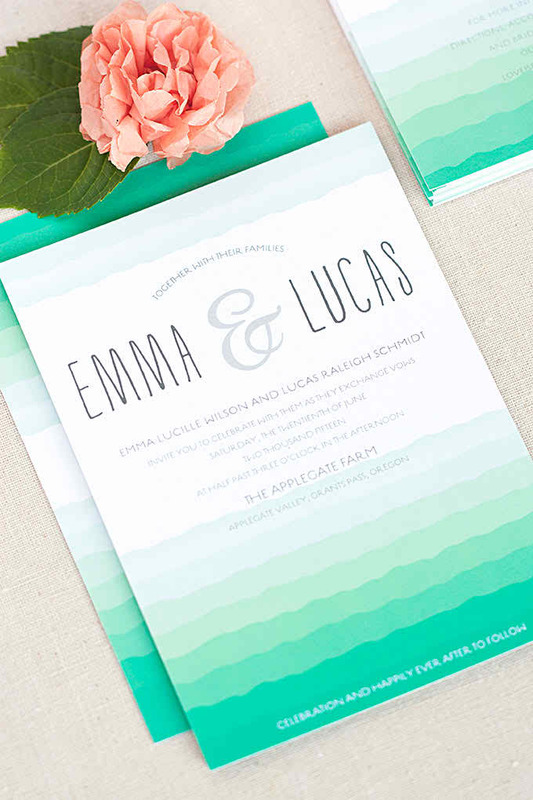 Always a fan of ombre, these ideas are fantastic! The ombre petals down the aisle are so fun! The macaroons! So, so pretty. OMG loving the macaron cake! Is there a tutorial for the sign? I would like to make something like this. Ombre is my favorite. Great collection of ideas! We love the ombre trend as well! These colors are wonderful! I am now craving something sweet! I love ombre and think it's a great design element! Thanks for featuring so many different ways you can use this trend.